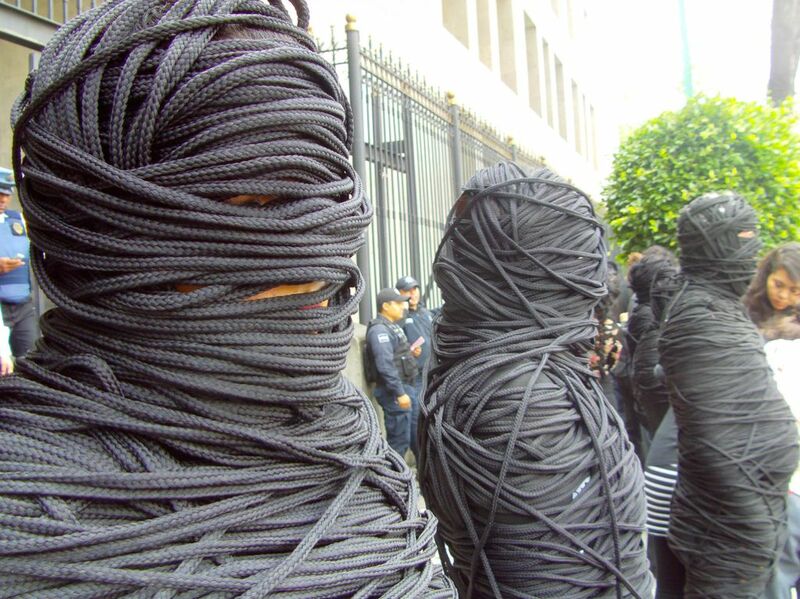 This was the call made by the mothers and family members of the disappeared in front of Mexico City’s Secretariat of Governance on October 10. The initiative was started by the mothers of the disappeared and assassinated, who are members of the Movement for Peace with Justice and Dignity (MPJD). Their goal is to bring visibility to those who can neither be called dead nor alive, and to those who continue searching for justice. It was the first in a series of activities planned for the coming months to ask for transparency from Felipe Calderón’s government, and to highlight the national emergency now that there are fewer than two months left before he finishes his term. Just as our children have names and faces, the authorities that have failed to do their jobs also have names and faces. We want the world to know who isn’t doing their job, and who is obstructing justice for those who are trying to find our disappeared children or know the details of the killings that have happened, even within the Movement for Peace. According to the MPJD, by the end of Felipe Calderón’s term there are 80,000 dead, 20,000 disappeared and 250,000 displaced. The figures almost lose meaning when looking at how quickly they’ve grown in the last six years. But each number has a name and a family. No one who was disappeared has returned home. No cases have been resolved, no one has been sentenced and none of the commitments made to the movement have been met after a year and a half of organizing. [I]t made me think about how to understand this hole, this hollow space that a disappearance creates … [I]t’s hard to understand just how awful it is for a family to have someone disappeared, because they cannot fill that hole until there’s justice. The victims of the supposed war on drugs that Calderón began when he assumed the presidency in 2006 want to show Mexico’s president that he has essentially abdicated his job of governing Mexico. They want him to leave office knowing he accomplished nothing and to draw the attention of all Mexicans to the lack of political will to resolve cases of disappearance. [W]e have not received a single response from the federal government, who we sat down to dialogue with on two occasions and they promised certain things before the term was up, and with two months to go, they have not met their commitments. Worse still, new cases have been opened into the assassinations or disappearances of members of the movement itself: Don Nepomuceno Moreno, who participated in the second dialogue with the government, was assassinated; Eva Alarcón and Marcial Bautista was disappeared at the end of last year; Pedro Leyva and Don Trino who also participated in the federal dialogues and who presented their cases directly to Calderón, have also been murdered. Malú García was displaced after the killing of her sister, María Alejandra García Andrade, in Ciudad Juárez. At the age of 17 she had to leave Chihuahua. “I’m a defender of human rights, an ever since I decided to support families that found themselves in the same situation as me.” For this, she has received death threats, and her children and her mother have been targeted with kidnapping and murder. Before their omission stands our presence, before their injustice stand our voices, our actions and our pain. We tell them again: more than ever we have had it up to here. We are more determined than ever to give our children the dignified life everyone deserves. These words reflected the voices of those who keep organizing through their pain and now ask for justice — not only for the dead and disappeared of their families, but for all of those who have been killed or disappeared in Mexico. In Olga Reyes’ words, “The only way that the country can be changed is when your case ceases to be your case and it becomes all of the cases.” Her words recall those of María Herrera, another MPJD organizer, who once noted that she had 20,000 disappeared children, not just four. At the protest Paz Pavón de Nuñez — who came with her daughter and her sister Adelita — met the mothers, wives, sons, daughters and husbands of the disappeared in front of the SEGOB building for the first time. It had been less than a month since her husband disappeared. She is also the aunt of a girl named Mónica, who disappeared on December 14, 2004, while attending university. “The authorities won’t give us an answer,” said Moncia’s mother, Adelita Albarado Valdés. “We want to know what has happened to my daughter. How is she? Where is she? What have they done with her? Dead or alive, we want an answer because for us right now we are dead while living.” Since her daughter’s disappearance, she has blended her profession as a clown with that of an activist mother searching for justice. This action, which brought together family members of the disappeared in front of the Secretariat of Governance offices, was the first of many that are planned in the coming months as a public, symbolic impeachment of President Calderón. They hope to get the president to present before the nation a true account of what he did and didn’t accomplish before he takes his final exit from Mexico’s presidential palace.